Although it’s not published yet, you might want to check out ‘What Would Jane Do? : Miss Austen’s Guide to Life’s Dilemmas’ by Rebecca Smith. It comes out tin September, and might be a fitting end to your Austen marathon. @Brickwallviews: That sounds like a solid read! 🙂 I’ll definitely check it out. Thanks! You have some good ones up here. I vote anything by Virginia Woolf – love her. Hi Cassie! The Waves is up after this list. 🙂 I don’t have enough Virginia Woolf pieces for a marathon (I need all of her works for that), but I’d love to do one this year. Love Virginia Woolf too. Thanks for dropping by! 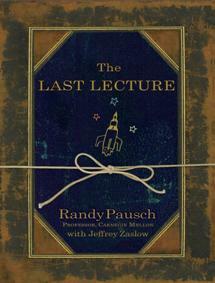 The Last Lecture is a great book with a powerful message that will stay with you for a long time. Jeffrey Zaslow, who co-wrote the book just passed away in a tragic car accident after leaving a bookstore promoting his most recent publication. Right now, I am enjoying the book and its incredibly honest and unflinching view of life. Bridget Jones was hilarious! I bought the first book (Bridget Jones’ Diary) and the second one (The Edge of Reason) at a book sale, so I got them at about $3.50 each. Definitely a steal! As for The Last Lecture, I’m reading it right now. It’s pretty good…I read a lot of *that* type of books (All I Really Need to Know I Learned in Kindergarten, It Was On Fire When I Lay Down On It, Don’t Sweat The Small Stuff, etc. ), and although TLL isn’t as detailed as those books – there are ideas I wish were explained further – it has a certain frankness to it, which is refreshing. Woody Allen’s Getting Even is quite fun as well. Ah, well. I’ve wanted to get my hands on a copy of that book for years. But, sadly, you don’t easily find Woody Allen books in the Philippines. I found my “Without Feathers” at a book sale and “The Insanity Defense” was the only book I saw at an actual book store. I’ll ask my sister to get me one from Barnes & Noble.